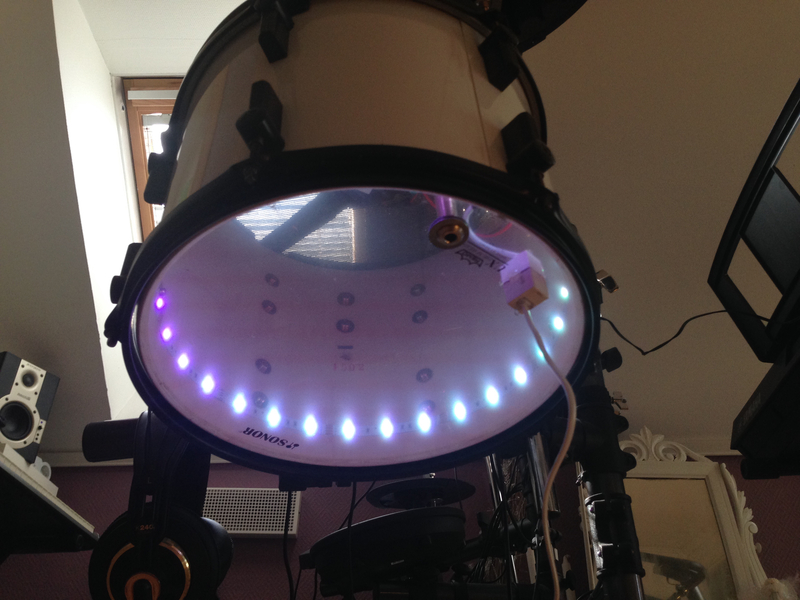 Just for fun, I have completed a small project to install LED strips into my drums. I did start with one tomtom. Led strips are very popular and can be bought almost every where in various lengths on the market. I bought mine on eBay (for a bargin) and ordered 5m RGB Led strips of the type 5050. (This model is a bit more light intense, compared to 3528. However the best are 5630 with most luminans.) The strips comes with a self-adhesive back so they easy to attach inside the drums. I was thinking for real while before selecting the connector. RGB strips needs four cables to work. (One for each color and +12V) so I needed a cable system which handled 4 connectors and for the right price. I found that the ordinary telephone cable system would do the work. The RJ11 connector system is easy to adopt using a special tool to attach cables with the connector etc. it is very easy to connect/reconnect this type of cabling when you are on tour. I had one rule for this project: no damaging drilling In the drums! But how could I attach a connector on the drums without drilling? 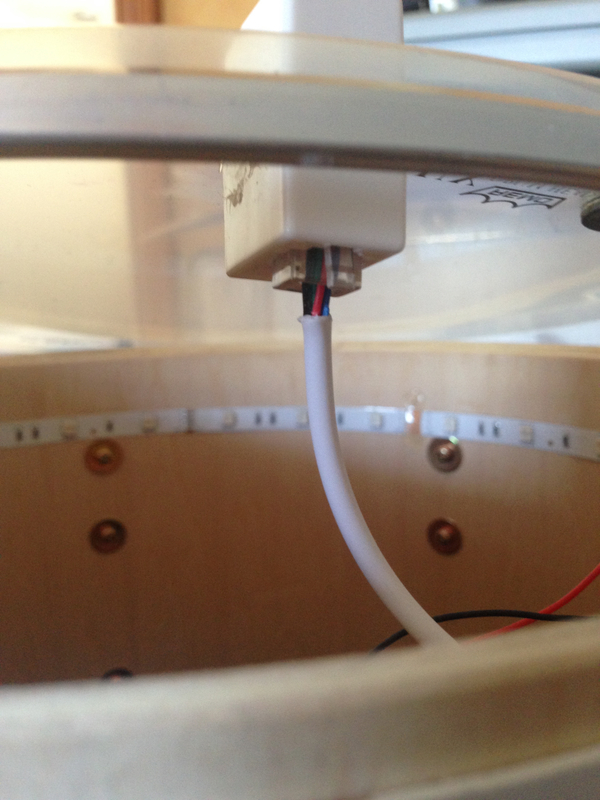 I used a way to do this, which I have tried before when installing the piezo sensors and that was to make a hole in the bottom drum head using a soldering iron tool. I found a very nice RJ11 connector which ordinary is used to extend two RJ11 cables. This connector is consisting of two RJ11 connectors mounted on each end. They are just pushed together and could be taken apart in the middle. Be careful so you don’t break it when tearing them apart. 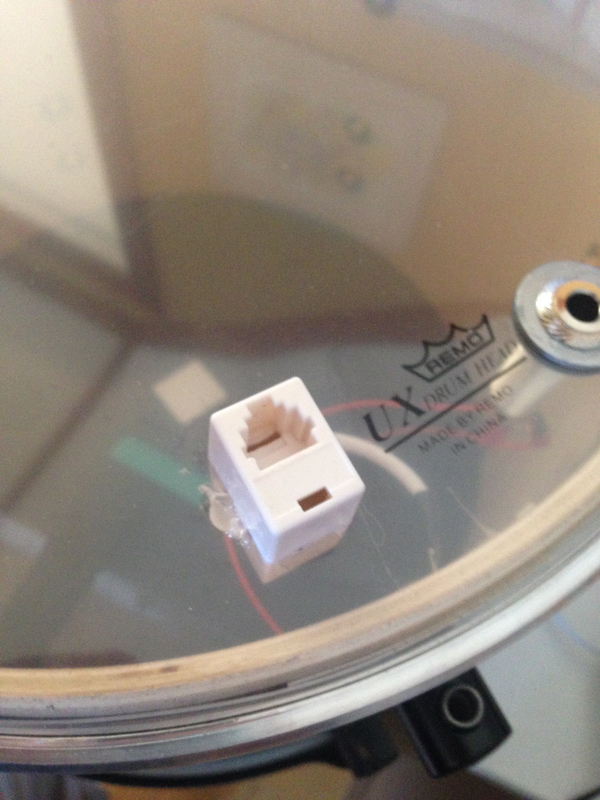 I was now able to attach a RJ-11 connector from each side of the drum head. The hole in the bottom head was created a tiny bit smaller than the extension connector edges. Make a mark on the drum head with a pen before melting up a hole on the drum head. Do the melting of the hole with the drum head un-mounted and under no tension. Attaching the led stripes was easy because of the self-adhesive tape, just tear off and attach in the drum. However the stripes did not attach 100% safe on the drums wood sides so I added some melt glue on a couple of locations over the led stripe to secure it. The length of the stripe can be adjusted through cutting it on the special marked spots on the ord strips which shows up at every 10 cm on the led stripe. Then it was just to attach the cables in side from the led stripes and to the RJ11 connector. So how can you control the lights inside the drum? Most LED stripe packages includes control units and remote control which will work fine for most purposes but I had higher expectations on my solution. 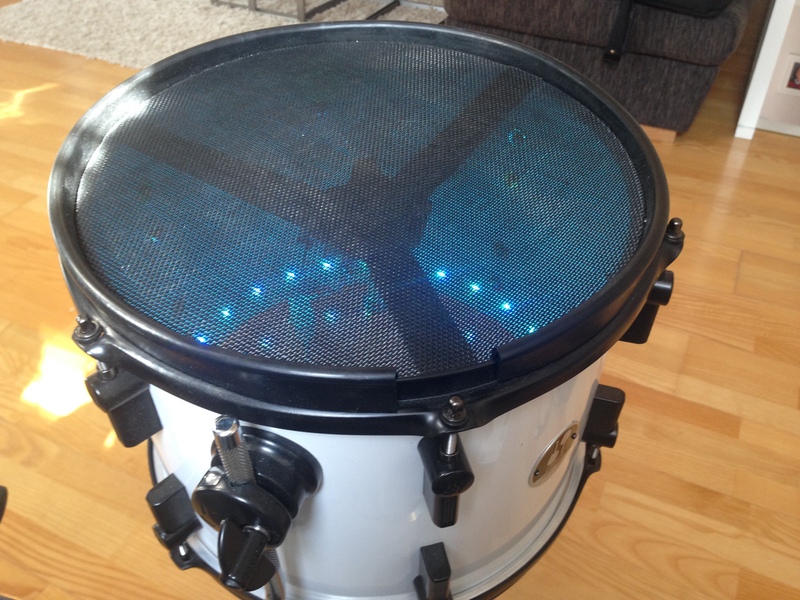 You can also buy special LED kits on the market which has electronics to react when you hit the drum. This is a nice feature which i believe will be exciting for about 5 minutes…and I wanted to create a drum light system which was a part of my bands light show. So how can this be accomplished? When on tour and been using light mixers and light systems there is standard to control all light called DMX. So my goal was to DMX enable the led strips in my drums. To be able to do this I found this cheap and nice 3channel controller device on eBay. It is converting dmx signals to RGB led strips and it is powerful enough to control several led strips in your drums. After attaching the DMX controller to my RJ11 cables and hooking up the DMX connectors to the light mixer…the drum is fully controlled and can handle color, flash events, dimmer just as you want to! Pretty neat! On the light mixer, a couple of patterns have been created for the LED drums which now could be triggered through a midi signal. (most light mixers do have midi in connectors) I have implemented so my kick drum triggers midi out signal from my MegaDRUM and 2box device which are sent to the light mixer…which steps between the light patterns. The e-drum seen from above through the mesh heads. Lights on! The e-drum seen from the bottom. I think the ladies will like this Anders!